Anticipation has been building for the new Windows Phone 7 Series ever since Microsoft unveiled it at the Mobile World Congress in February. 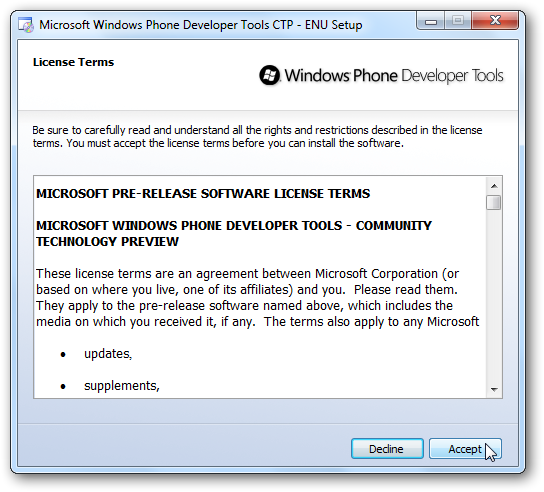 Now, thanks to free developer tools, you can get a first-hand experience of the basic Windows Phone 7 Series devices on your PC. Windows Phone 7 Series represents a huge change in the mobile field for Microsoft, bringing the acclaimed Zune HD UI to an innovative phone platform. Windows Mobile has often been criticized for being behind other Smartphone platforms, but Microsoft seeks to regain the lead with this new upcoming release. A platform must have developers behind it to be useful, so they have released a full set of free development tools so anyone can make apps for it today. 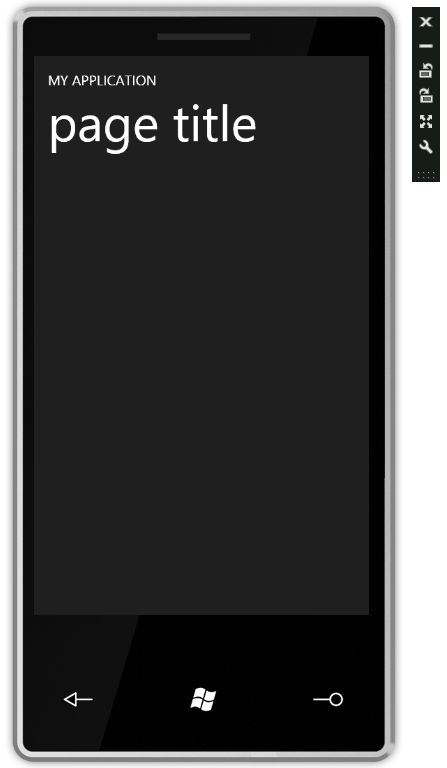 Or, if you simply want to play with Windows Phone 7, you can use the included emulator to try out the new Metro UI. Here’s how to do this today on your Vista or 7 computer. Please note: These tools are a Customer Technology Preview release, so only install them if you’re comfortable using pre-release software. 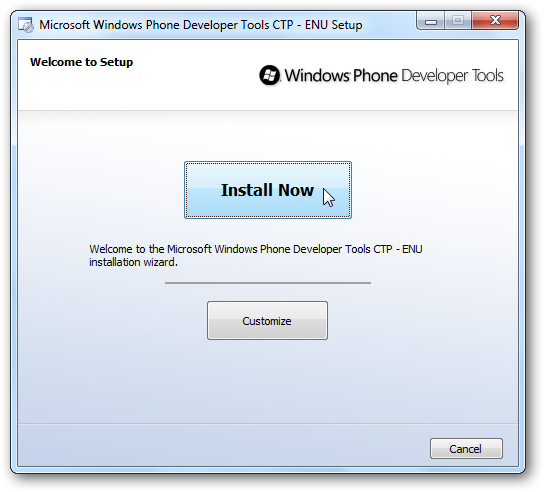 First, download the Windows Phone Developer Tools CTP (link below), and run the installer. 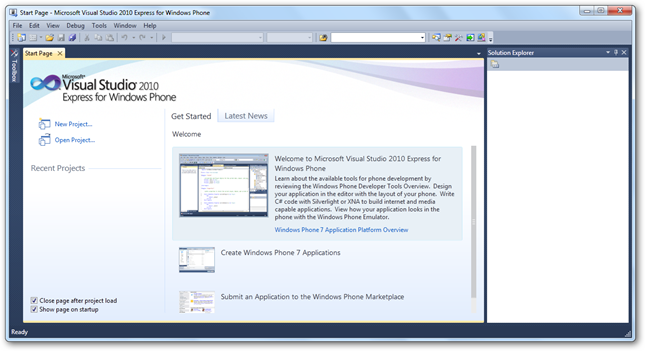 This will install the Customer Technology Preview (CTP) versions of Visual Studio 2010 Express for Windows Phone, Windows Phone Emulator, Silverlight for Windows Phone, and XNA 4.0 Game Studio on your computer, all of which are required and cannot be installed individually. Click “Install Now” to install the tools you need. The only setup customization option is where to save the files, so choose Customize if you need to do so. Setup will now automatically download and install the components you need, and will additionally download either 32 or 64 bit programs depending on your operating system. About halfway thorough the installation, you’ll be prompted to reboot your system. Once your computer is rebooted, setup will automatically resume without further input. When setup is finished, click “Run the Product Now” to get started. 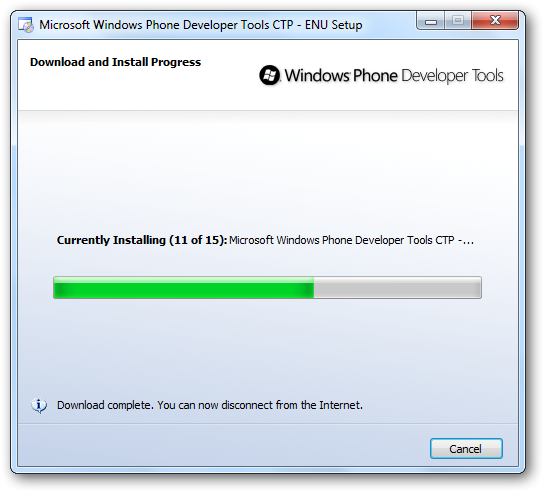 Now that you’ve got the Windows Phone Developer tools installed, it’s time to get the Windows Phone emulator running. 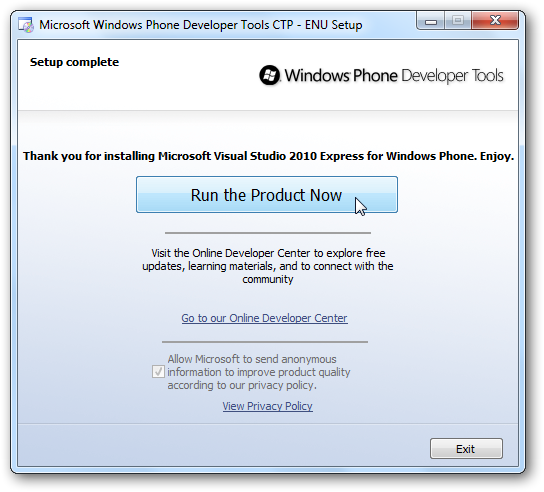 If you clicked “Run the Product Now” when the setup finished, Visual Studio 2010 Express for Windows Phone should have already started. 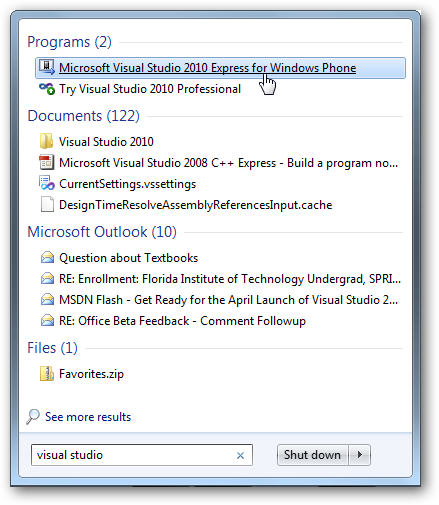 If not, simply enter “visual studio” in your start menu search and select “Microsoft Visual Studio 2010 Express for Windows Phone”. 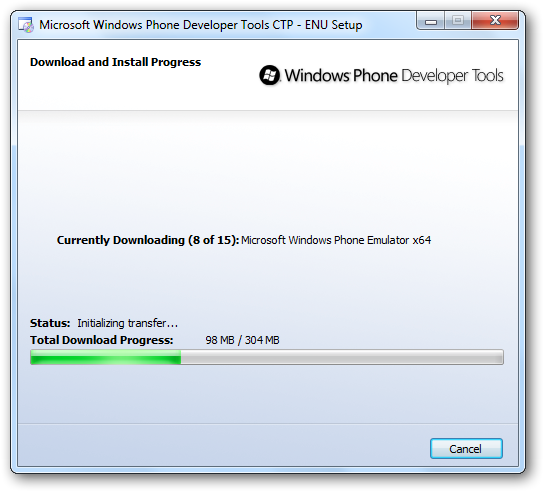 Now, to run the Windows Phone 7 emulator, we have to test an application. So, even if you don’t know how to program, we can open a phone application template, and then test it to run the emulator. First, click New Project on the left hand side of the front page. Any of the application templates would work for this, but here let’s select “Windows Phone Application”, and then click Ok.
Here’s your new application template, which already contains the basic phone application framework. This is where you’d start if you want to develop a Windows Phone app, but for now we just want to see Windows Phone 7 in action. 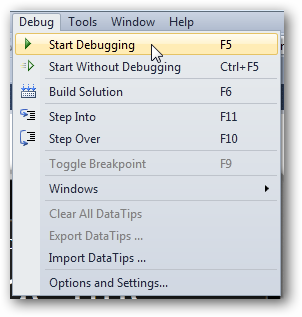 So, to run the emulator, click Debug in the menu and then select Start Debugging. 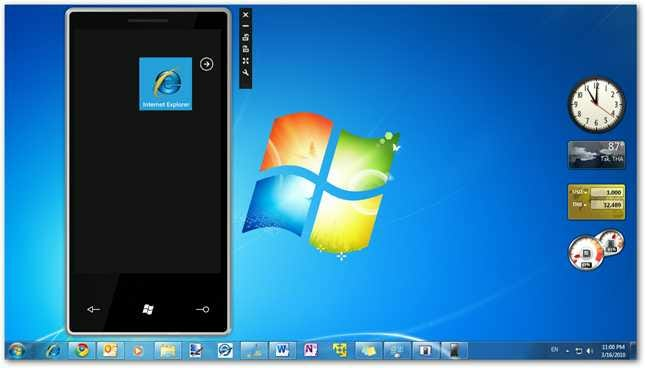 Your new application will launch inside the Windows Phone 7 Series emulator. 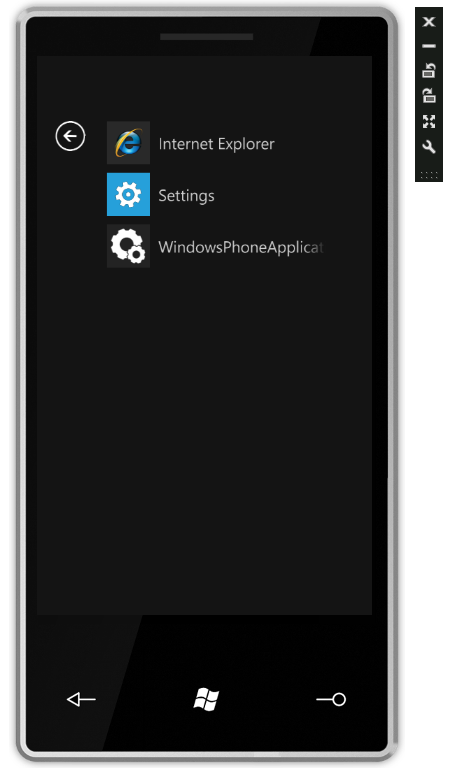 The default template doesn’t give us much, but it does show an example application running in Windows Phone 7. Click the Windows button on the emulator to go to the home screen. Notice the Zune HD-like transition animation. The emulator only includes Internet Explorer, your test application, and a few settings. Click the arrow on the right to see the available applications in a list. 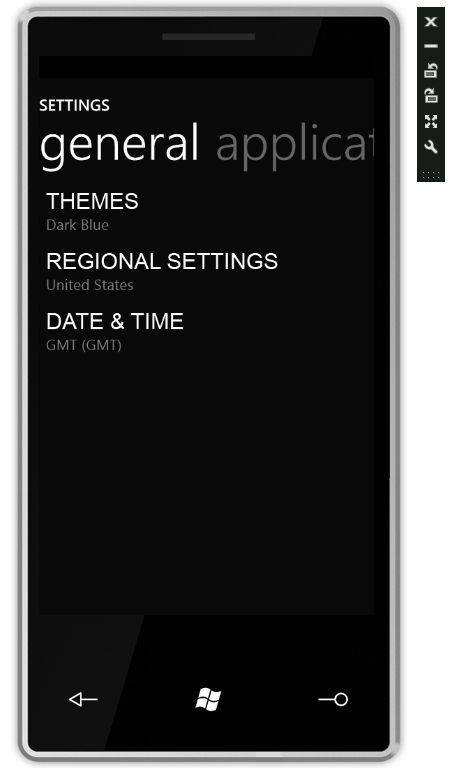 Settings lets you change the theme, regional settings, and the date and time in your emulator. It also has an applications settings pane, but this currently isn’t populated. 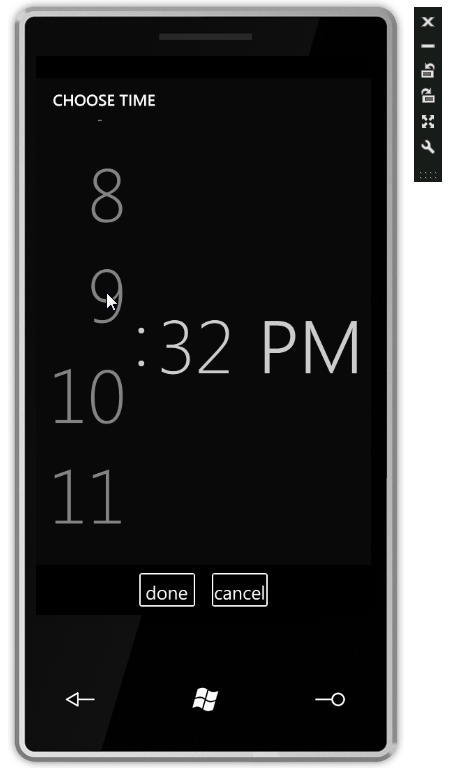 The Time settings shows a unique Windows Phone UI. You can return to the home screen by pressing the Windows button. 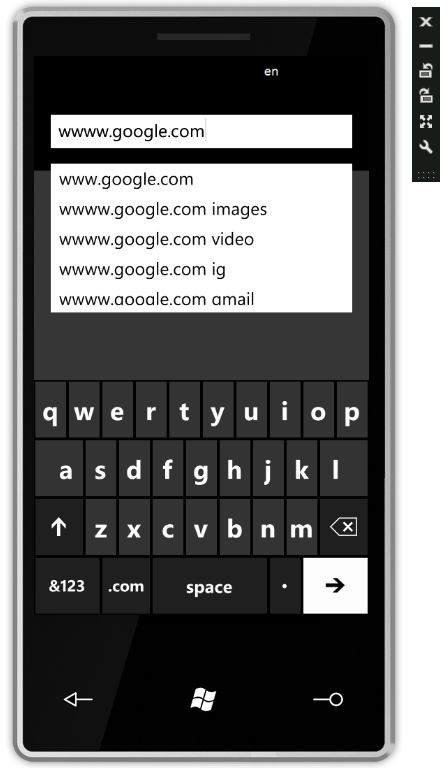 Here’s the Internet Explorer app running, with the virtual keyboard open to enter an address. Please note that this emulator can also accept input from your keyboard, so you can enter addresses without clicking on the virtual keyboard. 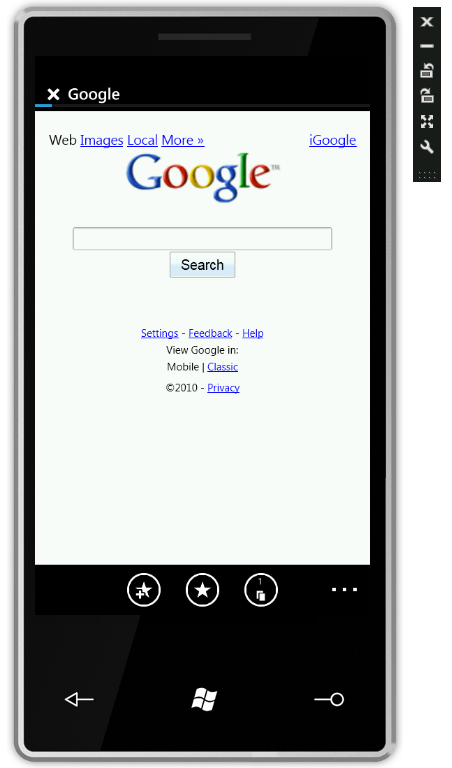 And here’s Google running in Internet Explorer on Windows Phone 7. Windows Phone 7 supports accelerometers, and you can simulate this in the emulator. Click one of the rotate buttons to rotate the screen in that direction. 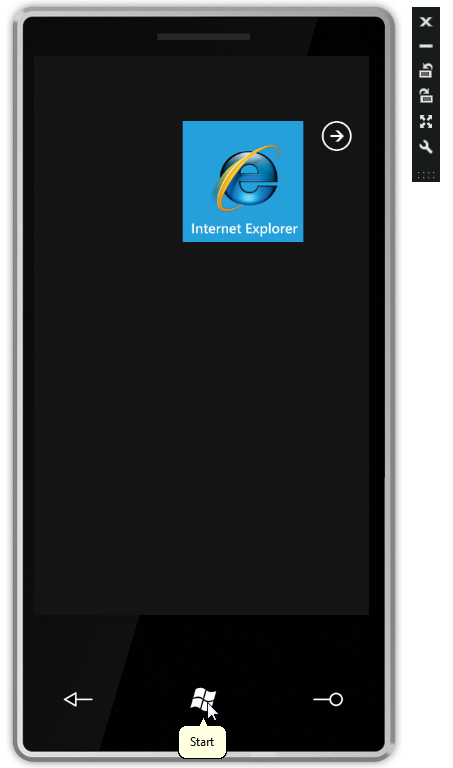 Here’s our favorite website in Internet Explorer on Windows Phone 7 in landscape mode. Although it may be fun to play with the Windows Phone 7 emulator, developers will be more excited to actually be able to create new and exciting apps for it. 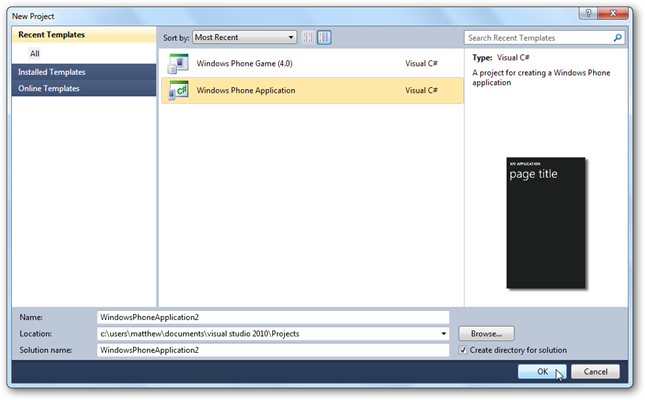 The Windows Phone Developer Tools download includes Visual Studio Express and XNA Game Studio 4.0 which lets you create enticing games and apps for Windows Phones. 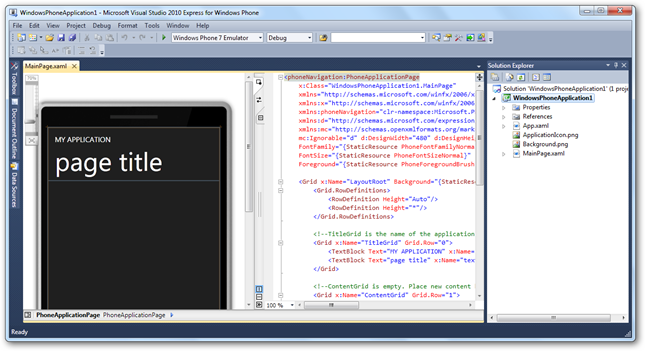 All development for Windows Phones will be in C#, Silverlight, and the XNA game framework. 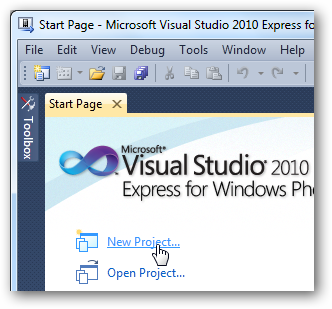 Visual Studio Express for Windows Phone includes templates for these, and additionally has code samples to help you get started with development. Many features are still not functional in this preview version, such as the search button and most of the included applications. However, this still gives you a great way to experience firsthand the future of the Windows Phone platform. And, for developers, this is your chance to set your mark on the Windows Phone 7 Series even before it is released to the public. Happy playing and developing!